Ask yourself if taking your pet with you is the right thing to do (for your pet and your family). If the answer is "no," then make suitable arrangements (pet sitter, boarding kennel, etc.) for your pet. If the answer is "yes," then plan, plan, plan! Make sure your pet will be welcome where you're heading – this includes any stops you may make along the way, as well as your final destination. If you're crossing state lines during your travel, you need a Certificate of Veterinary Inspection (also called a health certificate). You'll need to get it within 10 days of when you plan to travel. Your veterinarian will examine your pet to make sure it doesn't have any signs of infectious disease and that it has the appropriate vaccinations (e.g., rabies). This certificate can't be legally issued without a veterinary exam, so please don't ask your veterinarian to break the law. Make sure you know how you can find a veterinarian quickly if there's an emergency on the way to or after you've reached your destination. Online veterinary clinic locators can help you, including the American Animal Hospital Association's search and the Veterinary Emergency and Critical Care Society's emergency clinic directory. 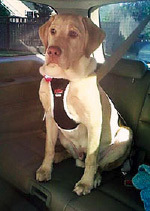 Properly restrain your pet with an appropriately-fitted harness or in a carrier of the appropriate size. "Appropriate size" means that they can lay down, stand up and turn around, but it's not so big that they will be thrown around inside the carrier in case of a sudden stop or a collision. No heads or bodies hanging out the windows, please, and certainly no pets in laps! That's dangerous...for everyone. 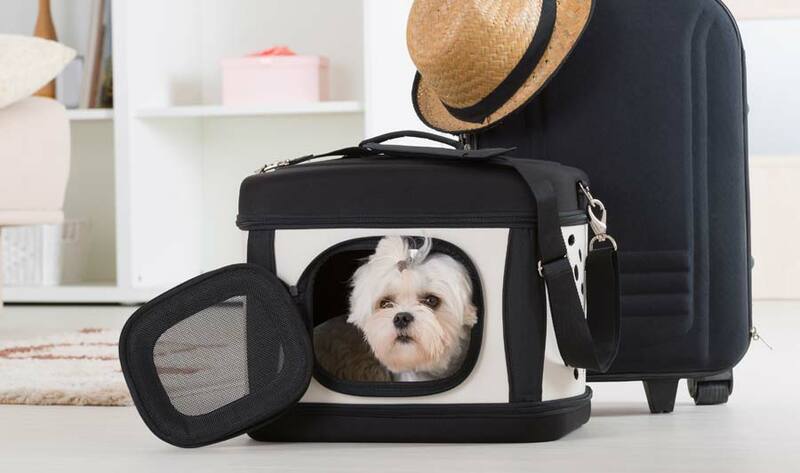 Make sure your pet is accustomed to whatever restraint you plan to use BEFORE your trip. Remember that road trips can be a little stressful on your pet. If your pet isn't already used to the harness or carrier, that's an added stress. Take adequate food and water for the trip. Offer your pet water at each stop, and try to keep your pet's feeding schedule as close to normal as possible. When traveling, keep a current picture of your pet with you so you can easily make "lost" posters and/or use the picture to help identify your pet if it becomes lost. Make sure you take your pet's medications with you, including any preventives (heartworm, flea and tick) that might be due while you're traveling. Make sure your dog is secured in a manner that he/she is used to before travelling.